- Very popular “9 bubbles” mirror with a large 850mm square padded frame. 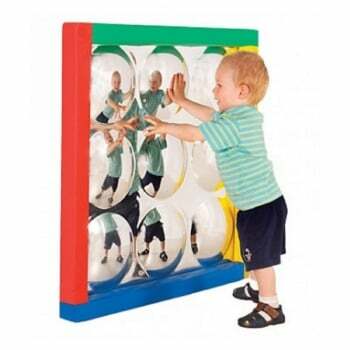 A myriad of images multiply with this wonderful moulded plastic safety mirror. Set in a colourful soft foam filled frame, the mirror is from a really durable, HAMMER TOUGH shatter resistant, safety plastic. The frame, made from phthalate free, fire retardant materials wipes clean. With wooden back. If using in the baby room mount at ground level, soft frame is safety padding and not designed as an aid to help babies pull themselves up to standing. Mounting plates provided but not wall fixings. Use mounted on a wall. Indoor use only. PLASTIC SAFETY MIRRORS: CLEAN ONLY WITH HOUSEHOLD FURNITURE POLISH OR DAMP/DRY CLOTH. NEVER WITH ABRASIVE OR AMONIA BASED WINDOW CLEANERS WHICH WILL SERIOUSLY DAMAGE THE MIRROR.